Mexene chili powder, 20-ounce plastic canisters (pack of 3) was designed to duplicate the popular taste of chili made by cowboys and loved by everyone in the area. 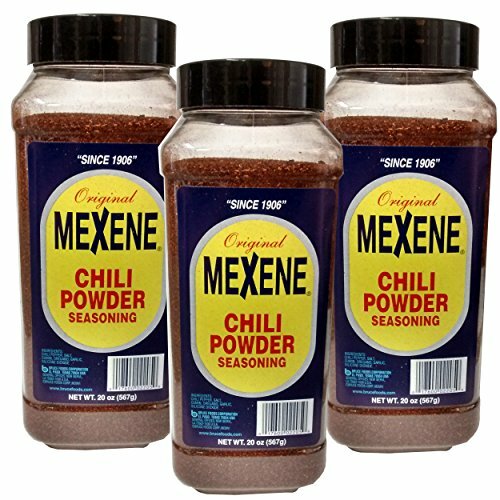 As the word spread and its reputation grew from winning chili recipe contests, mexene's distribution and brand awareness grew along with it. Today, mexene is manufactured in el paso, texas and distributed by bruce foods. The original recipe and manufacturing process remain the same as they were in 1906. Throughout that time mexene chili powder has used only the highest quality sun-ripened pre-frost chili peppers blended with cumin, oregano, and garlic. Just take a pinch between your finger and thumb, rub, and smell the delicious aroma. Mexene chili powder is called "the chili champions' choice" and is endorsed by casi, the chili appreciation society international. Mexene has been used in many of the winning recipes from the world championship chili cookoff in terlingua, texas. If you have any questions about this product by Casa Fiesta, contact us by completing and submitting the form below. If you are looking for a specif part number, please include it with your message.